The master chef brings in his finest culinary creation, "Would you prefer light meat, or dark?" Made for our photo story of "The White Cat"
Media: Head and paws made of Super Sculpey by Martha, painted with acrylics by Marianne, on a wire armature with a cloth body. He is dressed in 17th century style, with breeches, a brocade vest, over a shirt with ribbons tied to keep his sleeves up. 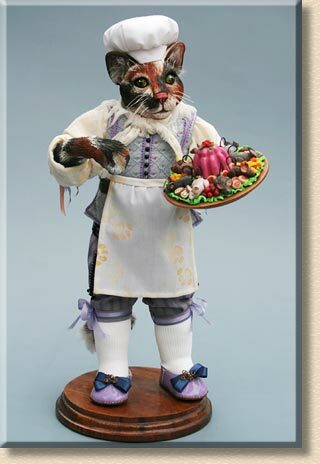 He wears a chef's hat, a neckerchief, and an apron stenciled with cat prints where he would have wiped his paws. Props: The platter is wood, and all the delectable treats are of Sculpey III. The mice are of Super Sculpey, wire, and painted with acrylics.